Since1935, cheese makers at the Rogue Creamery, along North Front Street in Central Point have been perfecting their skill – picking up world-wide awards for what many call the perfect blue cheese. One of the first things you notice when you walk into the Rogue Creamery is that machines aren’t doing the work. You won’t see a huge production line with automated processes, creating cookie-cutter blocks of cheese. It’s artisan, hand made and sustainable cheese that Rogue Creamery specializes in. 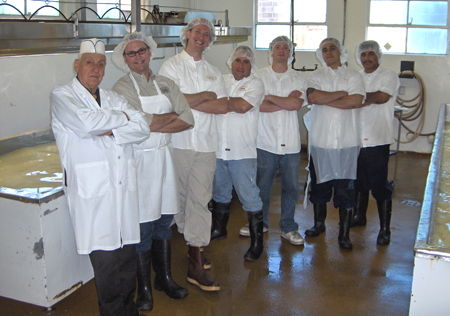 That’s the way Tom Vella did it when he started the creamery in the ‘30s and many of his practices are still in use today. Vella started making cheese in Sonoma, Calif. in 1931 , and during a visit to Oregon, noticed that all the ingredients were there for another outstanding creamery. The history of the creamery, along with a nice viewing area to see the cheesemakers make the cheddar cheese, is just a bonus when you visit the cheese shop. All you have to do is take a minute to ask a question, and you will get an education about the making of some of the best cheese in the state – if not the world. “Everything matters when you make cheese, the time of year ,what the cows eat on pasture and the amount of time it’s aged . The quality of the milk that is used to make the cheese is reflective of the crops that are grown in Oregon such as pears & hazelnuts ;this flavor is called terroir in the cheese and wine industry. ,” Plowman said. That’s why when Vella wanted to make blue cheese, he went to the source, France. Then created replicas of the caves French cheesemakers use to age their creations. Vella’s business was taken over after his death at the age of 100 in 1998 by his son, Ig Vella, who continued on his the family tradition of making world-class cheeses in California and Oregon. After several years of building the businesses, Ig realized that to have continued success, more attention needed to be given to the Central Point creamery, and he put it on the market. After reviewing several offers, Ig selected David Gremmels and Cary Bryant, two men who wanted to keep the creamery open and wanted Ig’s continued involvement in the business as Master Cheesemaker . The deal was finalized in 2002 and immediately the creamery did something no other American creamery had done – won the World’s Best Blue Cheese at the World Cheese Awards in 2003. Yes, even beating out the French. Since then products from the creamery have won numerous awards, and the owners are committed to working with local dairies and businesses to create a thriving artisan food culture in Southern Oregon. Every third week in March, the creamery is the site of a Cheese and Wine festival that has a number of booths that feature the best foods one can get in Oregon. In addition they have also helped Lillie Belle Farms start a chocolate shop on their property, and have also opened a wine tasting room and are working on other opportunities for local food businesses. “Our focus is on cheese, but we also want to be a destination for people,” Plowman said. About the Rogue Creamery: A 75 year old creamery that has won numerous world-wide awards for its amazing family of cheeses. The business, which is located in Central Point, Oregon is also the center of a fledgling artisan community, with a wine tasting room , a chocolatier and a glass blowing shop very close to the historic creamery. What to bring: If you plan on traveling with the cheeses in a car, make sure to bring a cooler if it’s a long trip. Otherwise the creamery does offer insulated bags to make sure the cheese holds up until you can get back to your hotel. Season: The creamery is open year-round, although there are specific times of year that cheeses are brought out of the aging caves . Simply call or e-mail the creamery if you want to find out what will be fresh and new when you are planning on being in the area. Getting there: The Creamery is located at 311 N. Front St., Central Point. To get there from Interstate 5 northbound, take exit 33 and turn left onto Pine Street. From Pine, turn right on North Front Street, also Highway 99, and the creamery is about a half a block away on your left. From I-5 southbound, take exit 33 and turn right onto Pine Street. Turn right onto North Front Street, also Highway 99, the building is your left. Tips: You would be amazed at how much you don’t know about cheese and the process that goes into making it. Make sure that when you visit the creamery you give yourself extra time and ask questions. While the staff is fairly small in the cheese shop, they make up for it by being experts in their craft. Tom VanVoorhees, cheese shop manager, is more than willing to take the time to explain what goes into making the cheese.